As you may know, earlier this year I embarked on a two week tour of people’s homes with label-mate Felix Hagan. The trip was an absolute triumph with no two gigs alike. Some were huge, some were intimate, all contained human beings of the greatest warmth and enthusiasm. I vowed to repeat the experience, so here we are again with me asking if anyone in the UK would like to host a house concert. This one is soon though – specifically October – so there’s not long to get the logistics sorted. I am thrilled to announce my touring buddy will be Richard Barry. I’ve known Richard for years. He’s one of the original Debt Records roster but our friendship goes back further. 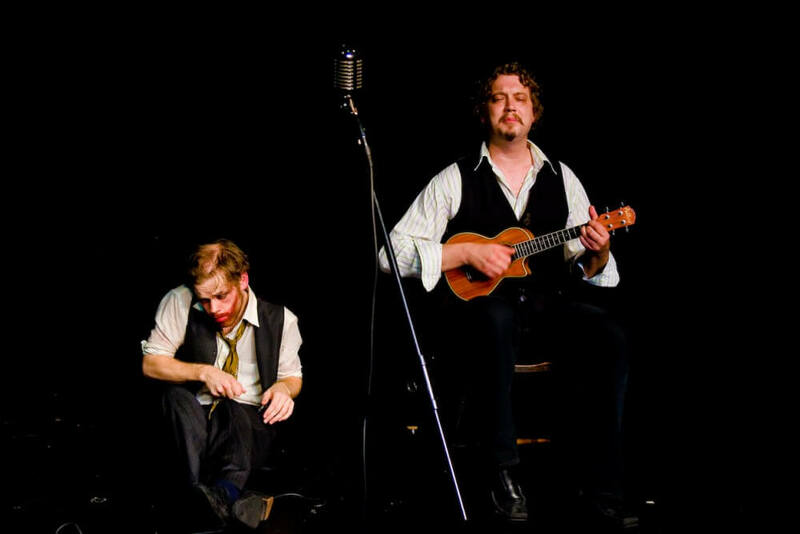 That picture shows us playing at 2008’s Edinburgh Fringe Festival (I’m on spoons in that instance but we did all sorts). Over the years we’ve written songs for each other, appeared in theatrical revues, guested on one another’s albums, supported/accompanied each other at concerts and generally got on each other’s nerves for the best part of a decade. And now we’re going on tour together. Same drill as last time: you provide the house/apartment/conservatory/cave/garage/tent/zeppelin and we’ll provide the songs. All unplugged. There are no set fees, just a friendly understanding that there will be a bunch of people there and that those people might be persuaded to throw money into the hat at the end of the night to keep our bodies and souls together. Email me via the Contact Section if you’d like to be involved or if you’d just like to get a bit more information about the project. The dates we have in mind are 1st-17th October. To get some idea of what to expect (in addition to the unexpected) you can read my diary of the last tour here. Hi there, my name is Jan & I would v much like to know more with the possibility of being involved in someway?! In anticipation, I look forward to your response. Hello Janet, that’d be great. If you send me an email via the contact page then I can keep all the responses in one place. I was just wondering about the house tour, do you send out an invite or is it up to the host? Can be an open or closed house, up to the host. All the ones on the last tour were mostly just invites by the host but there was a bit of communication via FB from others wanting to attend. So I guess it’s a bit of both.